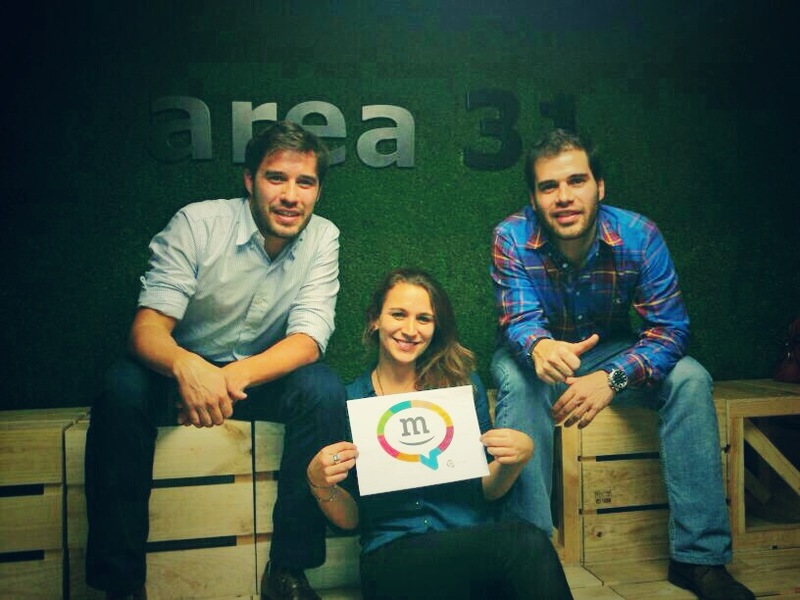 Andrés Pazos has been in Area 31 (IE, Madrid) for two consecutive calls. Originally he was selected for his startup Bidrink. This time around he is presenting mingles.es, which he has founded along with his two partners Amanda Wolffenbutel and his brother Gabriel Pazos. Mingles believes that the best way to improve language skills is through conversation practice. The concept is small conversation groups organized by levels and led by native speaking teachers. Sessions take place at trendy bars and cafes where you can speak while you enjoy a drink. All of it promoted and set up by an unique use of technology: mingles builds an online social network that comes to life offline. Amanda, originally from San Francisco, is the mother of the idea. After teaching English in Madrid for quite some time, she realized that: 1) students needed a more dynamic way to learn and practice languages and 2) students always asked to go to a bar. So we’ve put the two together and came up with Mingles. Mingles offers a professional, social and flexible way to practice languages. Whenever you feel like brushing up on a language in a social environment, all you have to do is go on to our web site (www.mingles.es) and find a place and a time that works best for you and you are ready to mingle! Mingles brings you the experience of socializing and having fun while improving a language skills, all of this always guided by our native speaking teachers. You only need to sign up on our website (very soon with an APP) and have fun at your session. The business model is very simple; the students pay online 10 € for each Mingles’ experience and they are offered a drink on us. We also offer ONE to ONE sessions and passes with a 20% discount. Mingles wants to grow and become a “long tail” for language learning services. We have been in touch with different investors, but at the moment the founders of the company are funding Mingles. We want to make our startup grow before asking for bigger investment. What is the stage of project now? Mingles is running at six bars in Madrid, offering sessions everyday of the week, both in English and in Spanish. The business model has been validated and now we are testing how to grow. In June we will establish Mingles in Barcelona. What role do the members play in the company? Amanda is the director of studies, responsible for teachers and creator of the Mingles method. Gabriel is the CEO and project manager and Andrés is the CTO and business developer. But the reality of startups is that everybody has to work in different fields in order to make the project run. What have you learned from your experience as entrepreneurs? Creating your own company is an amazing experience, but you really have to believe in what you do. It requires a lot of work including weekends and holidays. Sometimes things do not work out as expected. As an entrepreneur you have to make a lot of decisions and I would say you learn something new every day. What are you most excited about the project at the moment? We are moving all the operations online and the project is starting to run on its own. We are very involved in the sharing economy movement and we want to be a reference for learning languages and become the “Airbnb of languages”. What are the most difficult of entrepreneurship? In your opinion, what are the most important personality traits to be a successful entrepreneur? Is there anything you would go back and do differently if you had the chance? Of course many things could have been done differently. But now I would not change them because every single step and movement helps us grow, believe in, and improve our company. What new understanding since you started has had the most impact on your original plan? Our project is based on the experience and satisfaction of our students and teachers, so being able to listen to them everyday has helped us improve our service. Our profit is based on volume of people; often times we want to grow providing more bars, more languages and more areas but it is very important to understand the needs of your business in terms of development and prioritize them. What advice would you like to give to potential entrepreneurs? Build a great team that believes in the startup as much as you do. It is important that all the team members be involved from the beginning. Find the balance between technology and marketing and run them at the right time together, one without the other does not make much sense. And, finally, keep working hard with passion and brain to make your ideas happen.